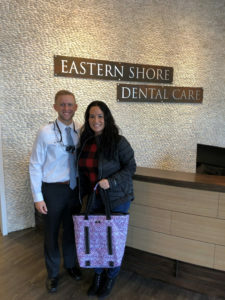 Dr. Kuhns with 2018 Referral Grand Prize Cruise Winner Arlette C.
Eastern Shore Dental Care is excited to announce their 2018 Referral Grand Prize Cruise Winner! Congratulations to Arlette C! Arlette referred 3+ patients to our practice in 2018 and as a result was automatically entered for the chance to win a Cruise Vacation. Her name was randomly selected just after the New Year as our Grand Prize Winner. A referral is truly the best compliment we can receive. Thank you so much to Arlette and to all of our patients that referred their friends and family to us in 2018. Interested in being entered to win our 2019 Referral Grand Prize? We’ll be making the grand reveal on February 1st so stay tuned!